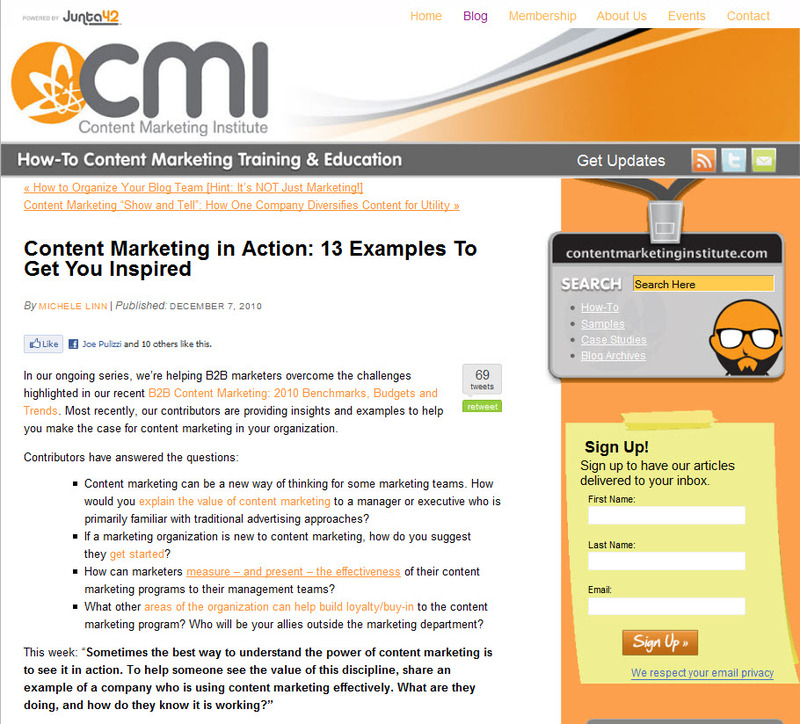 This last post in the recent Content Marketing Institute series about making the case for content marketing in your organization captures 13 Inspiring Content Marketing Examples. 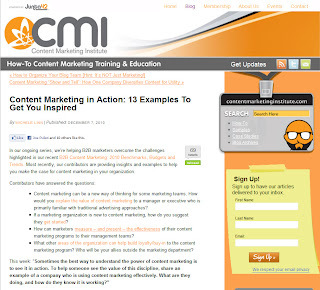 The post is titled Content Marketing in Action: 13 Examples To Get Your Inspired. Wait 'til you read through the 13 marvelous examples that the following content marketers have identified! 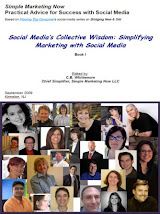 You will definitely enjoy the range of organizations and approaches to content marketing. My favorite example of effective content marketing comes from a UK company that sells worms… and other organic items called Wiggly Wigglers. Have you heard of them? I met Heather Gorringe, company founder in 2008 and wrote about her in BlogHer Business 2008: Hats Off To Wiggly Wigglers. I particularly admire that Heather uses a variety of content forms to create community around her products and the lifestyle that she and everyone at Wiggly Wigglers enables. In addition to the weekly Wiggly Podcast which recreates a fully sensory experience reminiscent of old-time radio broadcasts, the Wiggly Blog, a robust content-rich website, and a vibrant Facebook group, you can now watch The Wiggly Cinema. Success? Wiggly Wigglers is listed as one of the top five best international brand campaigns with Zappos. Better yet, Wiggly Wigglers has successfully reinvented organic farming. Which examples do you like most? What others have you come across that use content marketing in a way that effectively connects with potential customers and engages them?